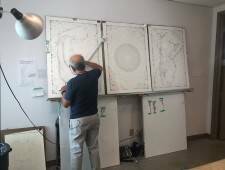 In the course of her artist residency in Art Lab from April 25 to July 10, Jessica Field will be undertaking the composition of larger-than-life schematic drawings. With a background in and intimate knowledge of programming theory, the content of these drawings will be informed by the identities and values of the people around her, ultimately attempting to address questions regarding the intervention of technology in humans’ lives. This – the second of two performances – will serve as an opportunity for data collection and give direction to Field’s work for the duration of her residency. They are not performances in the strictest sense of the word – with an actor and an audience – but instead will be experienced in the form of a lecture. Therein, Field will encourage willing participants to create a personalized map, while also contributing these to a larger schematic drawing.